The highway from Truckee to Loyalton in the Sierra Valley is traveled by many commuters these days. Loyalton is now a bedroom community to Truckee . Back in 1900, Loyalton was a sleepy ranch town with just a population of 50. That changed when The Boca and Loyalton Railroad came to town. A southbound freight train with a load of cordwood pauses on a sunny summer day on the Boca and Loyalton. The Boca Lumber Company had been logging the lower watershed of the Little Truckee River since the Central Pacific Railroad had been built in 1868. It used river drives to move its logs to the mill at Boca. The demand for lumber in the Western U.S. had not diminished, but economically transporting the lumber to the railroad was always a concern. As the timber cutting moved further away from the transcontinental railroad, a variety of methods were tried. The Lewis brothers had been operating a sawmill on the upper part of Smithneck Creek, 17 miles north of Boca, 9 miles south of Loyalton, since 1886. They started by hauling their lumber from the mill to Verdi using horses and wagons. They took it to Verdi rather than Boca because they had a box factory there. Due do the slow pace of horses, they switched to steam traction engines in 1888. These huge machines weighed 29 tons, and were basically steam locomotives on six foot diameter steel wheels. The steering was accomplished by a single front wheel. They hauled four to six trailers loaded with lumber behind them. The steam wagons were owned by their new partner, Captain John Roberts, who had been a steamboat owner in the Sacramento Valley. Roberts had used the traction engines to haul farm products to his steamboats. The monestrous smoke belching engines roared and clanked and scared livestock and started fires along the route to Verdi. The only way to appease locals was to run the steam engines at night. By 1899 the Lewis's and Roberts had tired of the steam wagons. 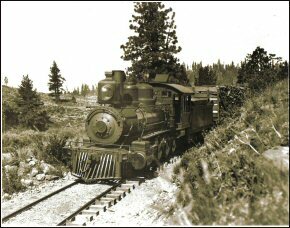 They determined that the time was right for a standard gauge railroad to the Lewis Mill and the Sierra Valley. A narrow gauge railroad, The Sierra Valley Railway had been sporadically serving the northern Sierra Valley since 1881. It connected to Reno, but did little to develop the lumber industry due to the different gauge tracks. Also it was not in continuous operation due to financial problems. The Lewis's had purchased most of the ranch land surrounding Loyalton and extended the town limits, so that they could control the saloon businesses. Keeping a sober, family oriented workforce had always been a problem in Truckee and Boca. The Lewis's were determined to prevent that problem. The Boca And Loyalton Railroad was incorporated on September 25, 1900. Work on grading had already begun in the spring of 1900. By July 28, 1900 the Mountain Messenger newspaper of Downieville reported that a crew of about 200 men were at work grading the roadbed from Lewis Mill to Boca. Ten miles had already been completed. By January 12, 1901 the railroad was complete to the Lewis sawmill. The Boca & Loyalton Railroad reached Loyalton in the summer of 1901. Loyalton was now a boomtown, with sawmills springing up at a rapid pace. Captain Roberts started his own sawmill and the Roberts Lumber Company. The Horton brothers, who had a mill in Clover Valley, north of Beckwourth, moved to Loyalton and added a box factory. The Turner brothers, who had been lumbering in the Sierra Valley for decades, built a planing mill. The Reno Mill & Lumber Company, who had operations in Reno and Beckworth, built a sawmill. The California White Pine Lumber company also moved into Loyalton. Other lumber mills were built along the railroad. At Pine, four miles north of Boca, Porter and Bruhns built the Sunrise Mill. Pine was at or near the location of the earlier Boyington Mill site. They logged to the east, high up on Verdi Range , using log chutes that can still be found today. The Merrill Valley Lumber Company built a mill in Merrill Valley and teamed their lumber to the B.&L. Lewellen Davies & Sons moved their lumber operations from Martis Creek to the southwest corner of Sardine Valley . Captain Roberts set up a sawmill at Boca, and began cutting timber north of Sardine Valley and hauling the logs on the B.&L. Four foot fir cordwood was was cut and hauled to Boca, where it was transferred to the Southern Pacific for the trip down to Floriston. Several stacks of cordwood still remain in the forest north of Sardine Valley . Other small timber operations started along the route. Loyalton had many advantages due to the location. Due to the climate, lumber dried quickly. There wasn't the heavy snow of Boca or Truckee . Timber and industrial land were cheap. Logging season was a month longer than the Truckee area. A new town of modern houses attracted quality employees. The ranchers of the Sierra Valley also benefited from the railroad. Beef cattle, dairy products, sheep and wool, hay and grains were all now shipped directly to the standard gauge connection to the Southern Pacific. Previously they had to drive the herds and haul the products on wagons. The headquarters, engine house, and shops of the B.& L. were at Loyalton. Boca didn't have the room. Loyalton wasn't the end of the line, rather it was the beginning of a rail system that would reach sixty miles further north and last until 2001. The engine roster for the B.&L. varied from a low of two engines to a high of seven when the Western Pacific was under construction through Plumas County and the Feather River region. To keep the tracks open in the winter they operated a wedge snowplow and a rotary snow blower. At times the tracks were closed for several weeks due to heavy snow. Between Boca and Loyalton there were 15 rail spurs into the forest serving the logging camps of the various mills. The timber supply did not last long, by 1908 most of timber south of Loyalton was cut over. The northern extension of the B. & L. continued northwest across the Sierra Valley to Beckwourth. There it crossed the Sierra Valley Railway. A series of lawsuits and a physical confrontation occurred before the crossing was allowed to remain in place. A spur was built west into Portola and up Grizzly Creek. In 1905, the B.& L. was sold to a subsidiary of the Western Pacific Railroad, then planning to build its tracks through the Feather River Canyon . They also bought the Lewis Mill that had been moved to Loyalton. The Western Pacific shipped all of its construction materials on the B. & L. while it was being built during 1908-09. The Clover Valley Lumber Company consolidated several of the smaller lumber companies in Loyalton and built a spur off of the B. & L. east of Beckwourth that ran up to Clover Valley. Eventually they extended the tracks another 40 miles north. The logging operations continued until 1957, using steam engines to haul the logs to Loyalton. Once the Western Pacific completed its tracks through Plumas County , freight traffic on the B. & L. dropped off between Boca and Loyalton. The company had only turned a profit for two of its years of existence. In 1916 the Western Pacific bought it at a foreclosure sale. The line between Boca and Loyalton was abandoned and the rails were removed in 1917. Portions of the grade in the Sardine Valley area were again used in the 1930's by the Hobart Estate Company for its logging railroad operations. The route between Beckwourth and Loyalton continued in use, by the Western Pacific, serving Loyalton's sawmill until it closed in 2001. The lumber industry at Loyalton lasted 101 years. Most of the route of the Boca and Loyalton can still be traced today. A switchback at Boca is still visible, and the grade is visible up to Boca Dam. When Boca Reservoir is low, the grade can be seen. It is a straight roadbed on the east side of Truckee River channel. From Boyington Mills campground north to Stampede Dam you can walk the old grade as it parallels the Little Truckee River. Above Stampede Resevoir it follows along Davies Creek and along the east side of Sardine Valley. It is easy to find the grade, as a forest road follows the route. From Sardine Valley to Loyalton, the grade parallels Smithneck Road on the west side of Smithneck Creek. While the Boca and Loyalton Railroad didn't last long, it did contribute to the Truckee area economy, and especially to the history of Boca. This article by Gordon Richards originally appeared in the July 3, 2004 Echoes From The Past column in the Sierra Sun.